Nearly 12,000 words this week. 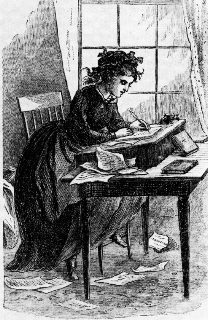 Yes, I am in what Jo March (of Little Women) might call a writing vortex. All I need is the special cap. No, really. I need the special cap. Do you think they have them at Target? I’m also taking a world building class since these new, crazy speculative worlds keep popping up in my writing. It’s time to put a little structure around them and dig a little deeper. Otherwise, a quiet week. Everything that can go out pretty much is out, so no submissions. No rejections (yet), and since I haven’t heard back, no acceptances either (funny how that works). I did follow up on some stories, since there’s a great deal of orange in my submission tracker.